The TrakInvest Show season 1 was held from December to January 2017 wherein 25000 users across India participated to invest INR 3,800 Cr ($540 million) of virtual currency through 1.8 million trades in a span of 3 months on the TrakInvest platform. The show garnered 1.5 million views reaching a audience of 10 million on digital social media. The Top 100 contestants were offered Jobs and Internships across the country. Here we introduce, the final top 6 that made it to the Grand Finale. Akash Gupta, is a 26 year old MBA student from Ghaziabad, Delhi. He has been a investor from 2003, beginning his journey with losses while his family was skeptical of his investments in stock markets. Akash Gupta always wanted to prove a point by being a successful stock analyst. He won The TrakInvest Show with his fast and calculative moves, studying & researching companies in-depth. One of his key stocks that helped him rise up the leader-board was Clean Tech Solutions. He shorted Clean Tech solutions because he believed that the firm was a loss making operation, and he made a cool profit of 24% on a single stock! This propelled him to the number one position with 55% portfolio gain which was the highest score on the show, being crowned as the winner of the TrakInvest Show Season 1. Satyajeet Nair, a 20 old year B.com student from Amity University was the first runner up on the TrakInvest Show Season 1. His passion for stock markets was from a very young age of 10 years, watching his dad trade in stocks while growing up. He begin trading on TrakInvest few months prior to the TrakInvest Show during which time he achieved a profit of 19% in his portfolio. He was surprised to discover this hidden talent, which gave him the confidence to compete in a bigger challenge. He felt he was ready. He followed a simple strategy of identifying fundamental strong stock and stuck with them, tracking their progress regularly. He invested in stocks of Just Dial, which gave him a profit of 40%. Animesh Choudhary, is a 22 year old IIM Lucknow student who hails from Bhagalpu in Bihar. He noticed that his parents were saving up money in banks at lower interest rates, and he felt the need to do something about it. That’s when he begin journey, investing in stocks with the aim to earn higher returns for his parents. For Animesh and his family, The TrakInvest show was a crucial stand point to test his skills in investing. On the show, he has always banked on in-depth research, critically analyzing the big picture while making his investment choices. 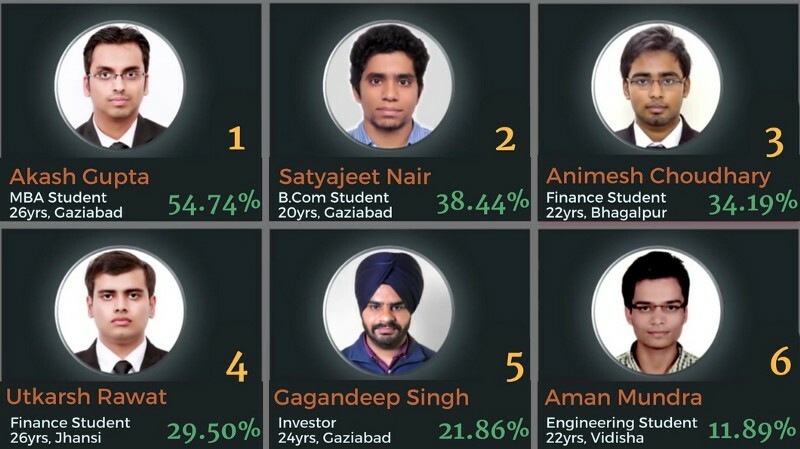 Animesh was ranked third with almost 35% returns on his portfolio. Utkarsh Rawat, a 23 year old finance student from Jhansi, is also a civil engineer from NIT Warangal, with no family background of trading in stock markets. He was attracted to trading in stocks because he was always fascinated with numbers, logic and analysis. During the show, he was addicted to stock markets, spending 6 hours a day. He gets ranked fourth with 29.50% portfolio gain and has learning to preserve for a life time. Gagandeep Singh, a 24 year old graduate from Punjab, followed his father’s footsteps, with a passion for trading in stock markets. Gagandeep started his journey with real money borrowed from his father, loosing INR 3 lakhs. This loss upset him badly enough to give up trading for a lifetime, till he discovered TrakInvest. He started practicing on TrakInvest and was able to recover not only his losses, but now also makes a regular monthly income by applying his trade ideas in the real stock markets. In The TrakInvest Show he was ranked fifth with a 22% portfolio gain. His story was covered by The Hindu, read here. Aman Mundra, a 22 year old engineering student from Vidisha, began his journey with the aim to change the perception of his family, who were skeptical about stock market investments. For him, this perception change was a bigger success than winning the show. He started trading just 2 months prior to the show, ranking sixth with an 11.89% portfolio gain. Other contestants that made it to the TOP 6, but were eliminated before the Grand Finale are Deepesh Panwar, Sudhir Kumar, Shailesh Bharadwaj, Rahul Kalra, Neha Bajaj and Vedant Wanchoo. Three cheers for these guys too for being in the Final top 6 during the show. In this upcoming season 2 of The TrakInvest Show, we hope that these real experiences of the top six winners will inspire many more to join the challenge. So, Gear Up, Start Practicing and see you soon on the trading floor.